England scored three late goals to overcome Malta’s stubborn resistance and stay in control of their qualifying group for next summer’s World Cup. Gareth Southgate’s side struggled to break down physical, resilient opponents and it was 53 minutes before Harry Kane broke the deadlock with a calm close-range finish from Dele Alli’s pass. As Malta tired, England exerted their authority and Ryan Bertrand sealed the win with a long-range shot that slipped past Malta goalkeeper Andrew Hogg with five minutes left. England – who are now two points ahead of Slovakia as they prepare to meet at Wembley on Monday – began to carve Malta open with ease and added two more in injury time, substitute Danny Welbeck steering in Kane’s pass before the striker added his second with virtually the final kick of the game from Marcus Rashford’s delivery. How did England’s players rate in Malta? England’s performance must be placed in the context of opponents who are physical, resilient, organised – and ultimately the scoreline had a convincing appearance. This was still, however, a largely colourless display until Malta, one of the minnows of the game with a world ranking of 190 and with a record of six defeats from six Group F games, tired and conceded those three late goals. It does not make for the easiest task but this was, in large part, a conservative and uninspired England display, lacking spark and relying on Spurs pair Alli and Kane to finally make the breakthrough. England opened brightly, with early wasted chances for Raheem Sterling and a Kane header that was well saved by Hogg, but then became bogged down in mediocrity, a state they only escaped in the final 10 minutes. And even England’s set-up had an over-conservative appearance. Was there really any need for Liverpool’s Jordan Henderson and West Bromwich Albion’s Jake Livermore providing the midfield base against a Malta side whose main, perhaps only, ambition was damage limitation? 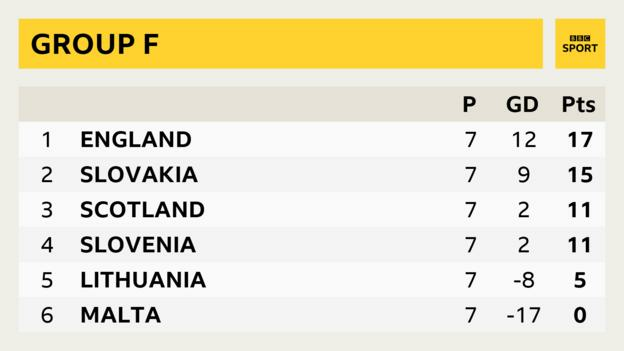 This was a win that keeps England on course for the World Cup in Russia, with hopes of taking another important step against Slovakia. Southgate’s side, however, have provided little compelling evidence in this group that they will make a serious impact at the sharp end of the finals, should they qualify. There is still time for England to develop, but this has been a campaign short on thrills and one not designed to send fear through the first tier of European clubs. Kane may have handed the captaincy over to Henderson in Malta – but he was once more the man who took responsibility to ease England’s anxiety. After rescuing a point with an injury-time equaliser against Scotland at Hampden Park in June, Kane was the beneficiary of good work from Spurs team-mate Alli before sliding in a calm finish for his fourth goal in his past three internationals, his 10th in 20 appearances, adding a second late on. Kane may have had what is now becoming his trademark goalless August but he is usually red-hot come September and he was not just involved as a scorer, he provided an enticing delivery for Welbeck to add the third in the final seconds, finding time to add one more himself. Alex-Oxlade Chamberlain showed no hangover from having to complete the formalities of a £35m move to Liverpool before leaving with England’s squad for Malta, delivering an impressive performance before being substituted with 14 minutes left. He was one of the few England players who showed pace and a direct approach in a grim first 45 minutes, in sharp contrast to the struggles of Sterling. Oxlade-Chamberlain was operating from a wide-right position which he does not expect to fulfil at Liverpool, where he hopes to be a central midfielder, but looked at home and had the beating of the Maltese defence. And in Rashford, with his lightning pace, England have a shaft of light as Southgate searches for a game-changer going into the World Cup. It was not sparkling but it was job done – and Oxlade-Chamberlain and Rashford were two of the brighter lights. England striker Harry Kane speaking to ITV: “Whenever you come away for games like this it is never going to be easy. We were trying to break them down, they had 10 men behind the ball. We knew if we just kept moving it wide we would find the space. England captain Jordan Henderson, speaking to ITV: “We didn’t have that many clear cut chances, we knew at half-time we had to keep going and we would break them down eventually. Dele Alli kept his composure to give it to Harry and when he is one-on-one he scores. England maintained their 100% record against Malta in international competition, beating them for the fifth time in five meetings. The Three Lions earned their first away victory since Gareth Southgate took charge, having failed to win any of their previous four under him (D2 L2). England have scored at least two goals in seven of their nine games under Southgate. Harry Kane is England’s top scorer under Southgate with five goals; more than twice as many as any of his team-mates. Kane has now scored five goals in his past three appearances for England, with all five coming away from home. Danny Welbeck has scored seven goals in his past eight games for England, however this was his first since March 2015 (v Lithuania). Ryan Bertrand is the first Southampton player to score for England since Rickie Lambert in June 2014 (v Ecuador). Dele Alli has been involved in just two goals in his past 10 international appearances, however both have come against Malta (one goal, one assist). Match ends, Malta 0, England 4. Second Half ends, Malta 0, England 4. Goal! Malta 0, England 4. Harry Kane (England) right footed shot from the centre of the box to the centre of the goal. Assisted by Marcus Rashford with a through ball. Goal! Malta 0, England 3. Danny Welbeck (England) right footed shot from the centre of the box to the centre of the goal. Assisted by Harry Kane with a through ball. Foul by Jean Paul Farrugia (Malta). Foul by Phil Jones (England). Jean Paul Farrugia (Malta) wins a free kick in the attacking half. Attempt missed. Kyle Walker (England) right footed shot from the right side of the box misses to the left. Assisted by Marcus Rashford. Substitution, Malta. Michael Mifsud replaces André Schembri. Goal! Malta 0, England 2. Ryan Bertrand (England) left footed shot from outside the box to the bottom right corner. Assisted by Jordan Henderson. Substitution, Malta. Paul Fenech replaces Ryan Fenech. Jean Paul Farrugia (Malta) wins a free kick on the left wing. Attempt missed. Jamie Vardy (England) header from the centre of the box misses to the right. Assisted by Ryan Bertrand with a cross. Foul by André Schembri (Malta). Attempt blocked. Harry Kane (England) right footed shot from the right side of the box is blocked. Assisted by Kyle Walker. Substitution, England. Danny Welbeck replaces Alex Oxlade-Chamberlain. Attempt saved. Marcus Rashford (England) right footed shot from outside the box is saved in the top centre of the goal. Assisted by Ryan Bertrand. Substitution, Malta. Ryan Camilleri replaces Joseph Zerafa because of an injury. Attempt missed. Alex Oxlade-Chamberlain (England) right footed shot from outside the box misses to the left. Assisted by Harry Kane. Delay in match Joseph Zerafa (Malta) because of an injury. Attempt missed. Jamie Vardy (England) right footed shot from a difficult angle on the left misses to the left. Assisted by Marcus Rashford. Substitution, England. Jamie Vardy replaces Dele Alli. Ryan Fenech (Malta) wins a free kick in the defensive half. Alex Oxlade-Chamberlain (England) wins a free kick on the right wing. Attempt saved. Harry Kane (England) right footed shot from outside the box is saved in the centre of the goal. Assisted by Ryan Bertrand. Attempt missed. Sam Magri (Malta) right footed shot from outside the box misses to the left. Assisted by Andrei Agius. ← Previous Story Transfer deadline countdown: Who could move and who needs what?